What scares me more than anything about Halloween? Well, the thought of walking into a haunted house. I’ll admit, I’m a big chicken when it comes to that kind of thing, but that doesn’t mean I can’t still be fascinated by it. 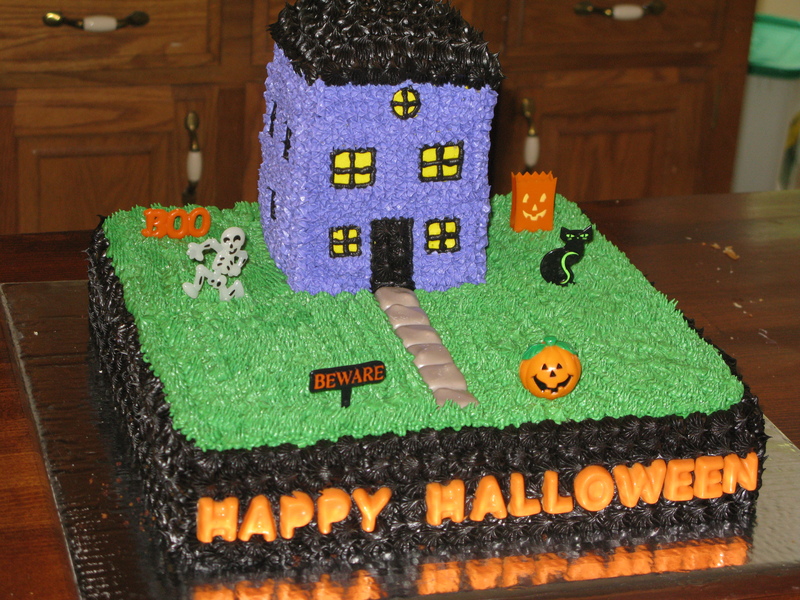 🙂 For months, the thought of a haunted house cake was in my head with what to make for Halloween. Unfortunately, time caught up with me on preparing the chocolates that I wanted to make for the cake, and wasn’t able to do everything that I wanted. There’s always next year to create an even better cake! Naked cake! As my dad would say, “Woo hoo!” The base is a 2 layer 12 inch cake. The bottom layer is yellow, and the top layer is chocolate. Wanted to mix it up a little bit. 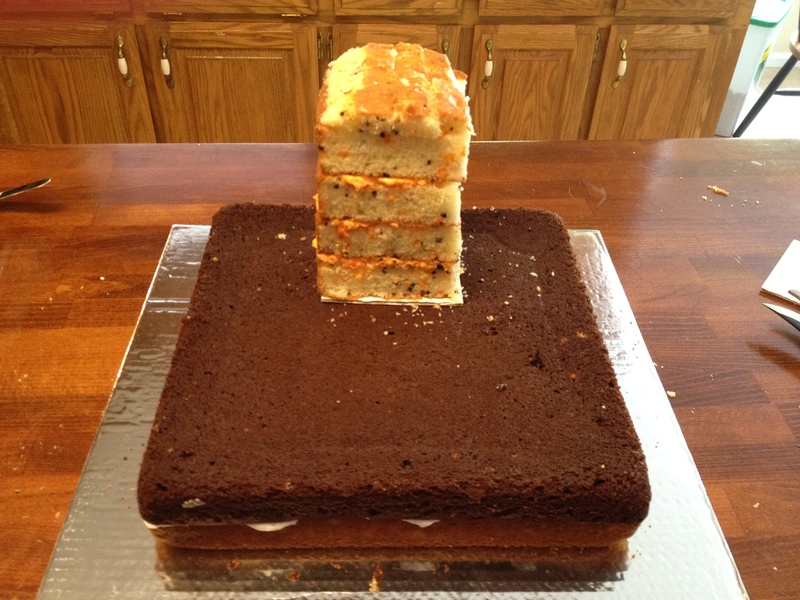 The house is made of an 8 inch cake that I cut up into 4 equal squares, and stacked the layers on top of each other. I put the house on a cake board and inserted some dowel rods to make sure it didn’t sink into the bigger cake. I also inserted a skewer stick (because they’re already pointed) to secure the house to the rest of the cake to keep it from falling over. 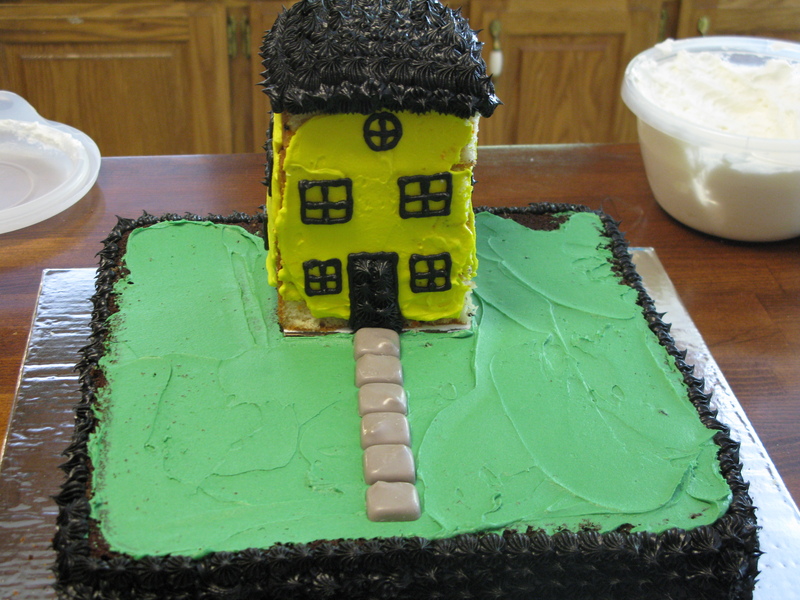 I started out by make some black icing using chocolate icing, and starred the color all around the sides, on the roof of the house, to make a front door and windows. The yellow background gives it the night time look for the windows. The little stones for the sidewalk are made out of chocolate. All covered in icing. I went with the purple to add a little color, but still wanted to use a darker color for the spooky effect. I used a grass tip to pipe the green icing all around the top of the cake. 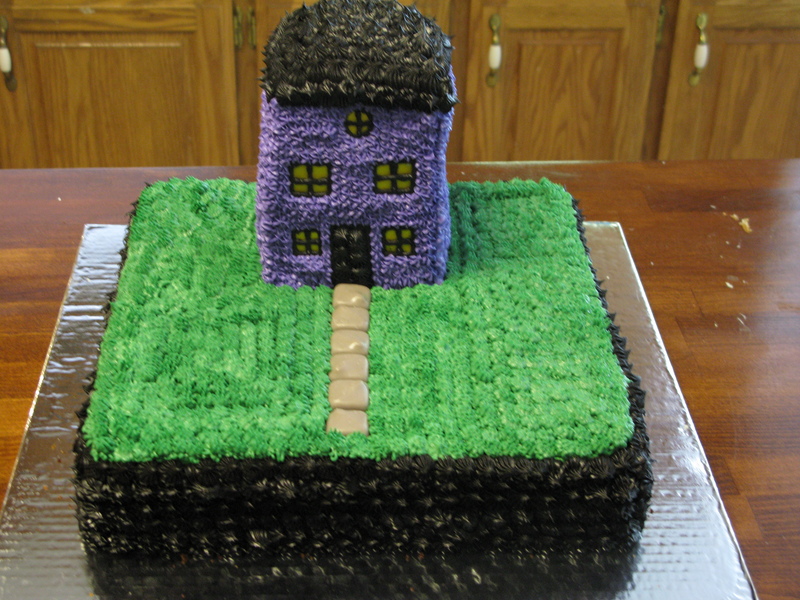 Perfecting the grass look with icing definitely takes some practice, so I still have more work to do! I originally wanted to make a little graveyard in the front part of the yard with little tombstones, but was pressed for time. So, I bought these little knick knacks at the local chocolate and cake decorating store to be the added decorations. I was just telling my mom today that this was a trial run, and next year’s Halloween cake is going to be massive! The letters are made out of chocolate. I like the beware sign, because I can tell you right now…I wouldn’t want to go inside this house! Spooky!